Gustiamo loves Anthony Mangieri. Gustiamo has been importing the best tomatoes for pizza for just about as long as Anthony has been making pizza. That, paired with the fact we are both obsessed with quality, makes it a no brainer that we are good food friends. Maybe you remember the Gustiamo Happy Video? Anthony made a cameo appearance in that video during a Skype session in which he and Patsy Grimaldi made pizza at the same time, it was a bi-coastal pizza making sesh. 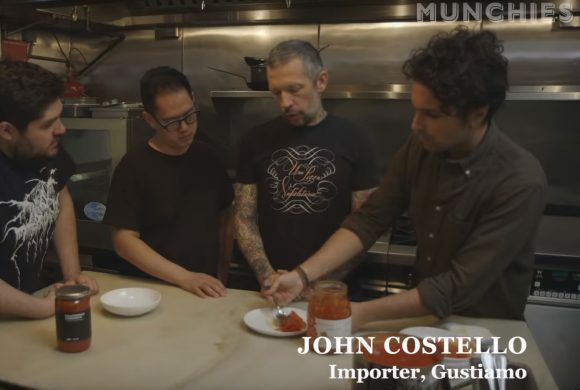 Fast forward to today, Anthony Mangieri is making pizza on the Lower East Side with fellow ingredient obsessed people, Jeremiah Stone and Fabian von Hauske Valtierra, using Gusti Tomatoes. Check out the segment below of Vice Munchies. It features Gustiamo’s very own John and the three official Naples approved pizza tomatoes (aka Verace Pizza Napoletana): San Marzano, Corbarino, and Piennolo. When you get to minute 4:06, you see John leading Anthony, Jeremiah, and Fabian in a tomato tasting. They go from DaniCoop Gustarosso San Marzano Tomatoes, to Casa Barone Piennolo Tomatoes, to Maida Corbarino Tomatoes. Esatto! There’s nothing like volcanic soil for tomato production.